Hi Carlomagno o Charlemagne (ca. 742 o 747 - 28 Enero, 814) amo an naging hadi han mga Franko nga nagpatikang han Baraan nga Imperyo Romano. Ginkoronahan hiya nga imperador ha 800. ↑ 1.0 1.1 Butler, Alban (1995). Thurston, Herbert J, S.J. ; Atwater, Donald. eds. Butler’s Lives of the Saints. Christian Classics. Vol. 1. Allen, Texas: Thomas Moore Publishers. pp. 188–189. ISBN 0-87061-045-7. Charlemagne: Biographies and general studies, from Encyclopædia Britannica, full-article, latest edition. Becher, Matthias (2003). Charlemagne. trans. David S. Bachrach. New Haven: Yale University Press. ISBN 0-300-09796-4. Collins, Roger (2004). Visigothic Spain, 409-711. History of Spain. Malden, MA; Oxford: Blackwell Pub..
Douglass, William A; Bilbao, Jon (2005). Amerikanuak: Basques in the New World. The Basque series. Reno; Las Vegas: University of Nevada Press. Einhard, putative (741-829). Annales Regni Francorum (Annales Laurissenses Maiores). The Latin Library. http://www.thelatinlibrary.com/annalesregnifrancorum.html. Einhard (1999) . Halsall, Paul. ed. The Life of Charlemagne. trans. Samuel Epes Turner. New York: Harper & Brothers; Medieval Sourcebook, Fordham University. http://www.fordham.edu/halsall/basis/einhard.html. Langston, Aileen Lewers; and J. Orton Buck, Jr (eds.) (1974). Pedigrees of Some of the Emperor Charlemagne's Descendants. Baltimore: Genealogical Pub. Co..
McKitterick, R. (2008). Charlemagne: The Formation of a European Identity. Cambridge, UK: Cambridge University Press. Molina Figueras, Joan (2004). "Arnau de Montrodon y la catedral de San Carlomagno: sobre la imagen y el culto al emperador carolingio en Gerona". Anuario de Estudios Medievales (ha Spanish) 34 (1): 417–454. Oman, Charles (1914). The Dark Ages, 476–918 (6th ed. ed.). London: Rivingtons. Painter, Sidney (1953). A History of the Middle Ages, 284-1500. New York: Knopf. Pirenne, Henri (2001) [1937 posthumous]. Mohammed and Charlemagne (Dover ed.). Mineola, N.Y.: Dover Publications. Russell, Charles Edward (1930). 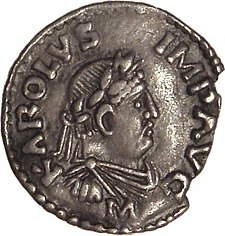 Charlemagne, first of the moderns. Boston and New York: Houghton Mifflin Co..
Einhard. "Einhardi Vita Karoli Magni". Medieval Latin. The Latin Library. Bakker, Marco (2003-2011). "Charlemagne". Reportret. Ini nga pakli kataposan nga ginliwat dida han 12:17, 16 Septyembre 2014.